Beginning in the 1970s, a series of lawsuits challenging Texas state public school financing produced a system that inexorably links Texas property tax policy with school funding issues. 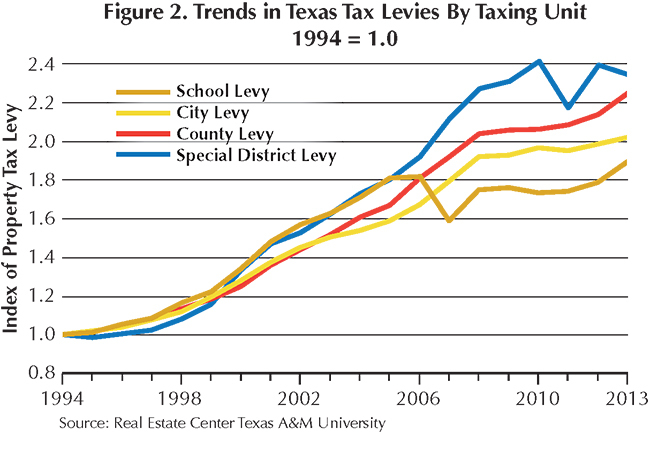 Failing to generate support for a personal income tax to equalize available resources across school districts, the Texas Legislature came to rely on local property taxes to meet those needs. 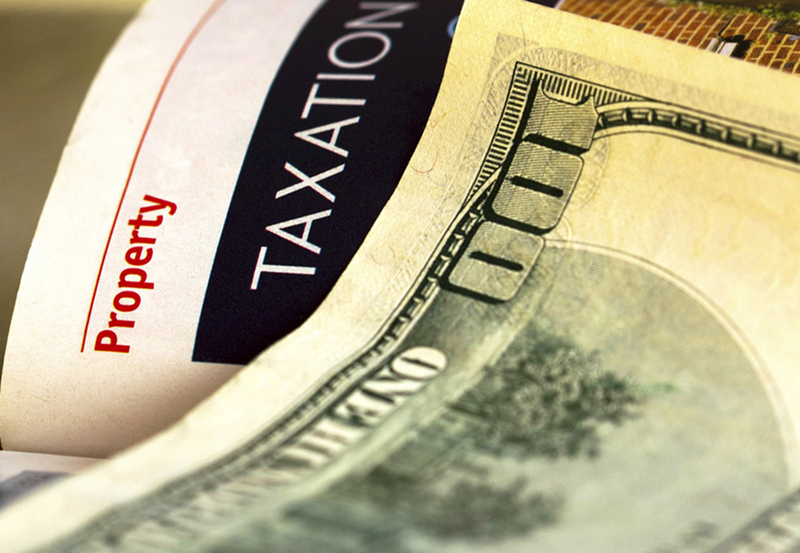 This dependence dramatically inflated tax burdens for Texas property owners. Effective tax rates increased from approximately 1 percent of market value in the early 1980s to rates approaching 3 percent in some areas of the state. In addition to rate increases, administrative reorganization created a single appraisal district in each county except for Randall and Potter, which share a single district. That move necessitated a comprehensive overhaul of the entire property tax system. Because home values tend to increase more rapidly than those of other property types, this new system shifted a growing proportion of total property taxes to homeowners. Frequent reappraisals caused sizable increases in taxes as rising values coupled with steady or rising tax rates increased tax liabilities. To counteract that tendency, the legislature crafted a number of measures designed to soften rising tax burdens. Concentrating the efforts on homeowners, various measures addressed the problem on two fronts. First, to ease homeowners' tax burdens, some measures exempt part or all of the taxable value of qualified homes. Second, to cushion homeowners from unanticipated tax increases, appraised value increases were limited to 10 percent each year for qualified homes. Third, so called "truth in taxation" provisions created a process to empower taxpayers to roll back proposed tax rate increases by taxing units. 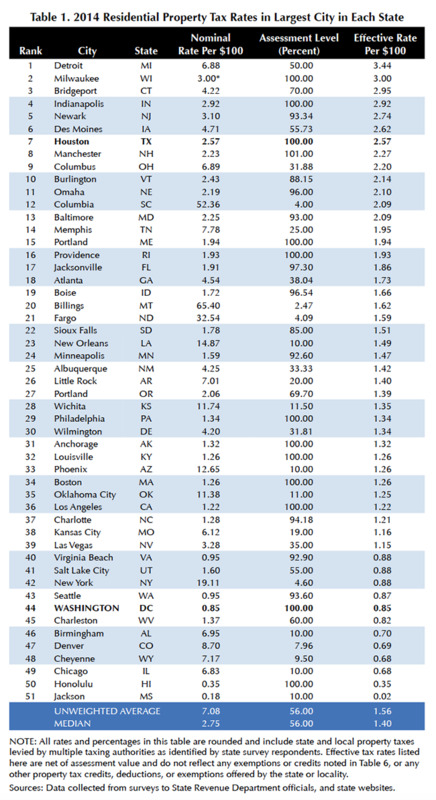 Despite these measures, property tax increases have propelled Texas 2014 effective tax rates for homeowners to seventh highest in the nation according to research published by the Government of the District of Columbia, indicating a substantial tax burden for Texans compared with other states (Table 1). Texas sales tax rates in Houston were also among the highest, ranking 13th nationally. ​​The report also analyzes the overall burden of state and local taxes for each state based on taxes in its largest city (Table 2). 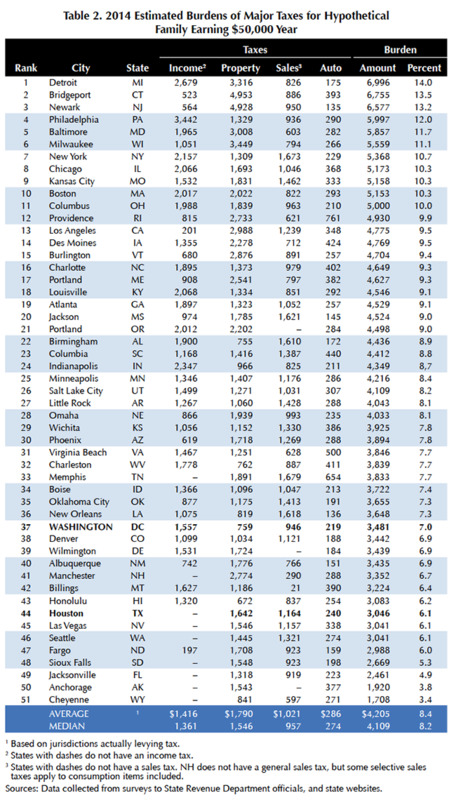 Houston ranks 44th among the 50 states and the District of Columbia with an overall 6.1 percent tax burden for a family with a $50,000 household income. That amounts to less than half the burden in the top three states: Michigan (Detroit), Connecticut (Bridgeport) and New Jersey (Newark). Texas' burden is well below the average of 8.4 percent and the median Utah (Salt Lake City) burden of 8.2 percent. Despite Texas' relatively low overall tax burden, the effective rate of $2.57 per $100 of value indicated in Table 1 continues to prompt outcries from taxpayers for further relief. This in turn has policy makers casting about for a measure that would provide significant tax relief through more restrictive caps on appraisal increases. Limits of 1 percent or 5 percent have routinely surfaced in proposals in the past. 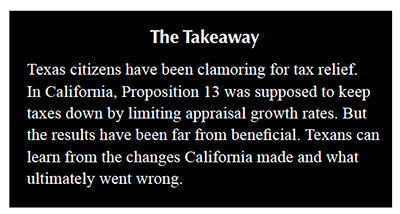 Similar pressures in California inspired the famous Proposition 13 tax measure in the late 1970s, which limited annual increases on appraisals to 2 percent so long as ownership continued in the same hands. This provision led to predictions that assessed values would lag market values in areas with rapidly rising prices. Decades later, circumstances confirmed that forecast. Further, the gap between market values and assessed values ensured that assessed values continued to rise even when home prices fell in California because the actual market value of the homes continued to exceed the restricted assessed value. Homeowners, faced with a diminished home value, angrily demanded to know how their taxable value had risen, only to learn that the passage of time had produced unintended consequences from Proposition 13. Further unanticipated consequences of the limits continued to roil taxpayers. Newer homebuyers began to notice substantially lower taxes applied to long-term homeowners, with properties of equal market values incurring vastly different tax liabilities. This horizontal inequality tended to inhibit sales by those with longstanding tenure and impose higher taxes on newcomers and younger homeowners. These conditions led a taxpayer to take the matter to the U.S. Supreme Court contending that such a scheme violated the Equal Protection Clause of the U.S. Constitution (Nordlinger v. Hahn). The Court ruled for the assessor, affirming the Proposition 13 limitations. Thus, the unequal treatment of homeowners persists in California. Proposition 13, combined with legislation responding to litigation also had a negative impact on California's public schools (Serrano v. Priest). Will the tax policy be regarded as "fair"? 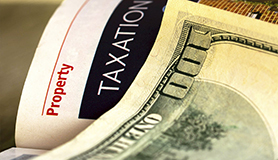 See Real Estate Center publication 2037: Property Taxes: The Bad, The Good, and the Ugly for a discussion of these criteria. 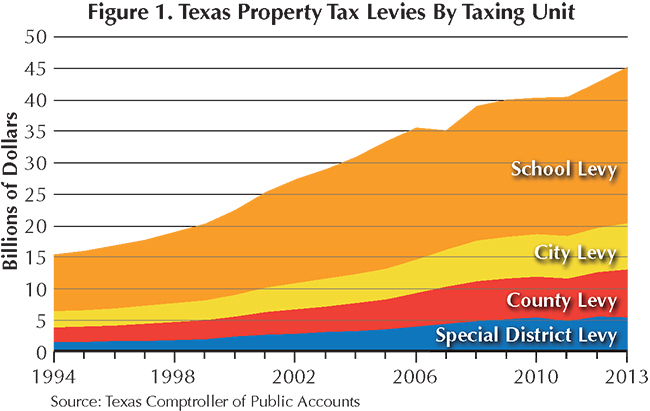 Total tax levies by the various taxing entities in Texas from 1994 through 2013 are shown in Figure 1. In 2013, the $24.85 billion school tax levy represented 54.9 percent of the total, down from 60.3 percent in 2005. Obviously, school taxes compose the major portion of property taxes statewide. Consider the index of tax levies adjusted for inflation to 1994 dollars shown in Figure 2. Values greater than 1 indicate a real increase in tax revenues. At 1.9, school tax levies have nearly doubled in real terms since 1994. Other units' levies have more than doubled since that time. However, prior to 1994, school levies grew more rapidly than the other units. From 1994 through 2005, school levies also increased faster than other units. Tax relief measures taking hold in 2007 halted that trend. Special district levies, fueled in part by the addition of numerous groundwater conservation districts after 1997, have expanded most rapidly since 2005. However, both city and county total levies also expanded rapidly from 2005 through 2008. From 2009 through 2011, levies did not grow for cities, counties, and schools. However, in 2012, cities, counties, and schools began to expand their total levies once more. These expanding numbers reflect the combined influence of local growth and local decisions to provide more revenue to the various taxing units. Some, perhaps a major share, of the expansion of special district levies can be traced to the implementation of statewide water policy provisions in response to regional water planning. Arguably, supporting this planning effort involves prudent outlays designed to provide water for future generations of Texans. Increasing city and county levies reflect individual local governmental decisions to pursue activities requiring local public expenditures. These locally focused actions presumably address concerns of the local citizenry. Texans would do well to keep these criteria in mind when weighing the merits of proposed policy changes. Currently, some citizens argue that the property tax base as it is configured does not provide adequate funding at a reasonable tax rate. Further restricting tax caps would aggravate that situation. A restrictive cap, such as the one California has adopted, could foster noticeable and growing distortions to the efficient operation of housing markets over time. Reducing tax liabilities by capping appraisal rates multiplies inconsistencies in the tax system as time passes. Finally, although Californians have decided that unequal treatment producing substantial variations between homeowners is justified, Texans would do well to carefully weigh these long-term effects resulting from tightened caps. In addition to these factors, imposing the cost of supplying public goods on those enjoying them through higher taxes causes taxpayers to weigh cost and benefits before supporting spending measures. Reducing tax burdens for homeowners, arguably the main beneficiaries of local government expenditure, could bias them in favor of more spending because they bear a lesser burden than they would face without the caps. As the debate over high property tax burdens progresses, Texans should be cautious to avoid even larger problems for the future. Dr. Gilliland (c-gilliland@tamu.edu) is a research economist with the Real Estate Center at Texas A&M University.